This post is in some ways a response to the Jerry Coynes and Sam Harris’s and others who blame religions for human actions; it is also a response to my reading a certain professor’s study of Christian origins from a perspective that yields no quarter to any explanation that resorts to “something unknowable to the modern historian”. In this post I will outline a way of understanding the nature of religion — as well as an understanding of what religious believers are really engaged in with their beliefs and practices — from a considered empirical perspective. Religion is a human creation and should be understood like any other human activity. Yet in reality religion is rarely seen as something so natural or as something that can be evidently explained in mundane human terms. If someone religious does something crazy or cruel many of us are likely to blame the religion itself as a cause as if the religion is a monstrous force that took possession of willing or unwilling slave. Some even speak of religious memes as if there are free-floating genetic-like forces that can infect and plague the unwary. If someone joins a bizarre cult many of us will likely say brainwashing was to blame. Religions can appear to be mysterious powers, divine or demonic. Religious scholars and even those not so religious can scarcely bring themselves to understand the origins of a great faith in terms of the same sorts of historical forces that are assumed to give rise to other institutions. Everything that follows is based on my reading of some of Hanges’ explanations of Durkheim’s sociological explanation of religion (from Reappraising above and other works) and a perusal of Durkheim’s Elementary Forms of the Religious Life (online). So understand these are elementary student notes cut very bare for a basic overview. With apologies to genuine students of sociology! 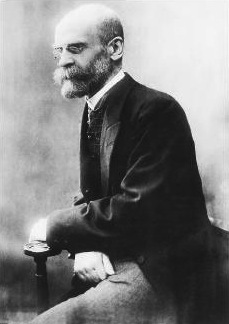 To understand religion in modern societies Durkheim began by examining how religion worked in primitive societies. This way he expected to understand the fundamental principles of social institutions that become increasingly complex in the societies we know. Though religious ideas and institutions in modern societies are complex they can nonetheless be more easily understood if we can see the more primitive forms from which they have derived. Every individual is aware that he lives at two levels: as a private individual limited by his physical body and as a member of society, as part of a group that transcends any individual. Society wields a power external to us and that is far greater than any of us. It represents an identity that is greater than any one person. Each of us has a very close (and subordinate) relationship with it. We each live in some sort of communion with this power. I think we can see where this idea is headed with respect to the origin of “god”. Religious beliefs are fundamentally our symbolic projection of the society to which we belong and of our relationships to it. Society’s over time tend to fragment. It is natural for clans to break up over time. No religion is born ex nihilo. No religion is literally unique, sui generus. New cults that emerge as stable social entities begin as parts of existing cults. These new cults will share various systems with their parents or former affiliations. This fragmentation will find religious expression in the new community. The causes of the fragmentation and the symbols of the new religion will be inseparable. Myths will explain the reasons for the separation and why the new group exists separate from the old. Do we begin to hear echoes of Christianity’s stories explaining how they parted ways from Judaism? Of Lutheranism’s departure from Roman Catholicism? Of Branch Davidians as a departure from a departure of the Seventh Day Adventists? Of a violent jihadist sect from a broader Muslim group? All thought categories are modelled on society and all are essentially religious. We know ourselves as individuals, limited and private, and we also know ourselves as part of something far greater, our social group. We accordingly classify everything in our experience according to this duality. Everything is classified as either profane or sacred. Experience of the sacred correlates with our collective social experience and is the foundation of our identity. Some years ago I was sharing a very convivial evening at our local pub with happy friends and just-as-happy others all around when one friend in particular said that we were all experiencing something religious. “What tosh!” I said. But she persisted. I wonder now if Durkheim might have agreed with her. The experience of being part of society is the experience of a power that transcends us and our individual limitations. It is both “overwhelmingly profound” and “limited in time and space”. It is an experience that we repeatedly seek out at special times or occasions. The experience is channelled through symbols and rituals. In primitive societies the symbol of this power is the totem. This totem is the emblem of the group. It is its name, its identifier. All members of the society identify themselves by reference to this symbol and all participate in its power. These societies (even as primitive clans) are really socially constructed groups. They are not truly blood related. They are all capable of speaking of “fictive kinships”. All members are family. All share the same name. In more sophisticated groupings the symbols can be more complex. They can be “incarnated” in “persons and formulae”. Jesus Christ is thus a human totem. The “family members” of the group all share reciprocal obligations even if as a rule they are geographically isolated. And as social groups continue to segment and spread there appears an ever expanding cluster of groups that are in various way related to each other, each with their own (but related) totems. The image becomes one of a universe expanding, dividing, with new gods emerging or being reclassified. We have an ever changing cosmology. Recall here how Paul says Christians are indebted to the Jews for certain things. I can see here how and why we cannot expect all subgroups of sects (various constellations within the larger cosmology) to think and act the same. A Jehovah’s Witness’s taboo against blood transfusions will be reprehensible to other Christian constellations. In the same way it surely follows that members of an Islamic cult dedicated to the kidnapping and murder of non-Muslims cannot be considered representative of Muslims who condemn such barbarism. That is, the Islamic religion is not a demonic power subtly brainwashing all adherents to prepare them to tip over the edge and commit murder. Islamic religion represents a social group like any other religion and within that Islamic universe there are a host of constellations — some with warm affinities with one another, others separated by unbridgeable gulfs. Like Christianity. As mentioned above, myths explain the origins of each group and where it fits in relation to others. But something more actionable binds societies’ members. Since they share a certain relationship with the universe and all else around them, classifying time, space, powers, all things according to sacred or profane, they all share a common perspective of what is positive and negative, of what is to be partaken and what is to be shunned, of taboos, prohibitions. These do’s and don’ts are effectively the only real glue that ensures the stability of each clan or society. The members are united by their shared name, their totemic identifier, and held together by their taboos. The implication of this is that to attack or destroy the symbol of a religion can be considered by followers as an attack on them personally. Observe how some of us can be stirred to violent rage at the sight of someone burning our national flag. It seems to me to be too facile, even in some way obscene, to blame a whole religion for the barbarism of ISIL or ISIS. Thugs and murderers have to be held accountable for their own actions. To focus on a religion in response to the atrocities of criminals strikes me as letting them off the hook somehow or at least minimizing their accountability. I can’t buy that. Sure there are many harmful religious ideas out there. Human rights should always trump cultural and social values — of every ethnic group. And yes, people can fall into ways of thinking and behaviours that they later “wake up to” with shame and deep regret. Humanity is a complex organism. It needs to be understood. Simplistic and uninformed responses don’t help anyone. Trying to understand minds and behaviours in the world today (or in the past) in human terms is always an option. Posted on 2015-01-25 06:23:53 GMT+0000 by Neil Godfrey. This entry was posted in Ethics & Human Nature, Religion and tagged God. Bookmark the permalink. As long as some people on either side think “they” are all alike, the culture war will continue, and from time it time it will become a shooting war. And there are people who don’t have any problem with that, either. My viewpoint is that the answer likely lies in between the extremes of ‘religion poisons everything’ and ‘religion is not the problem, only certain fanatics are’. Also I think that Muslim scripture is worse than Christian scripture in what is advocated against the unbeliever, and in consequence more violence springs from adherence to it. Yes, softer forms of Islam soften the meaning of jihad by making it a personal struggle and also some softer forms speak out in condemnation of terrorism. But I am not seeing this being nearly as extensive as, for instance, most Christians deploring the Westboro faction’s actions. This is admittedly just a viewpoint. There are so many disparate voices, and I, as you, am at the mercy of what I am exposed to. All sides must ‘sell’ their spin. The truth is hard to get at. I try to liken religion to nuclear power. It can help us live more comfortably but it can also be used to destroy cities. But even that’s not a perfect analogy because the arrow of causation between belief and behavior can go both ways; unlike nuclear power. A patronizing perspective—The premise is based on a Western Meta-narrative that sees a particular (and mythical) western historical trajectory and its dealings with Christianity as a default measure for all world histories and religions. A favorite western myth (or propaganda) is the presumption that societies “evolve” from simple to complex….probably based on its own history as evolving from the dark ages to the enlightenment. Civilizations older than the “Western” civilization have come and gone—in between the fall of one civilization and the rise of another are periods of “struggle”. (I am using this word because “dark ages” is too western) It is not that we go from simple to complex—rather we fluctuate between simple and complex….each value system should be looked at in its own right and some patronizing, blind, person/group’s biases, myths and presumptions should not be overlayed onto it. The definition of “Religion” is also problematic—and likely comes from a Protestant understanding/outlook. In this outlook, religion is limited to theology (conception of God/s)—The most immediate aspect for the followers of many world religions is not the conception of God/s but Law. (ethico-moral principles (or “values”) that govern individuals and societies) Religion should be understood as a value system. With such a broad understanding of the term—other value systems such as Secularism, Libralism, or whatever can be more appropriately compared. This gives us a better understanding of human nature both in terms of its universality and its diversity. I completely agree that simplistic, dogmatic, and intellectually lazy efforts to understand the (complex) nature of human beings and they ways in which they relate to a larger group and organize societies is an exercise in futility. Before evaluating “others”—it may be wise to critically evaluate one’s own meta-narrative…?….. Even when I dissent, Neil, I find your articles and summaries well worth downloading and filing for further reference and reflection. That’s great. Sometimes I enjoy discussions on the Bible Criticism and History forum for the same reasons. I certainly find myself learning lots or being prompted to rethink and explore new ideas and confront challenges to old ideas with many of the books I read.